The 2012 growing season has proven itself to be quite a challenging one. I keep wistfully thinking back to the 2009 and 2010 growing seasons (our first ones) where the rains came at perfect intervals and the temperatures were moderate the entire summer. Everything was easy, our first year hops produced beautiful cones. We were lulled into thinking that hops were such an easy crop to grow. After the training, trimming and weeding of the hops yard in early June, we were pretty happy with our results. But then, we began to notice, day after day of beautiful sunshine and clear blue skies. Hmmm... time to start hauling water out to the hop yard. Although we have an awesome irrigation system installed at our hop yard, we have not yet made the "plunge" and established a water well. 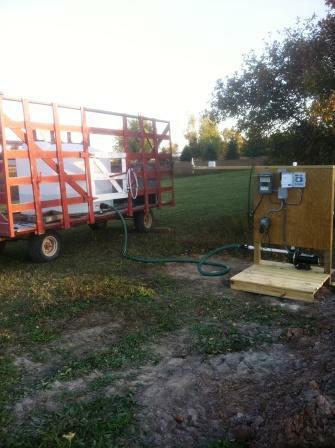 We continue to use our tractor and tank system to get the water out to our hop yard. So the hops are getting water, but probably not enough to make up for the complete lack of rain in our little section of the world. Total rainfall for June: 0 inches Total rainfall for July so far: 1.85 inches. There are lots of nice bugs in our hop yard, lady beetles and lacewings, but they were outnumbered by the bad bugs. I consulted with a scientist who works at Dow chemical to learn the best method of dealing with all of these problem insects and to create the lowest impact on the beneficial insects. We came up with a viable solution. Many thanks to Matt. To help with the problem of too many pests, my husband unearthed a wonderful piece of equipment from my father's stash of old farm equipment - A battery powered sprayer. A little bit of clean up and it is ready to go. I tow it around behind our atv and it works like a charm and allows me to spray insecticide and fungicide over our entire yard in about one hour. It is so nice to be able to make use of the stuff we have lying dormant around the farm. Thanks Howard! Despite the drought conditions and the voracious insects, we are still managing to have some good progress in our hop yard this summer. Lupulin glands are present. So, all in all, it isn't that bad. We are going to have plenty of hops to harvest! The irony of nature, is that weeds do not seem to be affected by drought or insects. It is once again time to bring out our sheep "stihl" to take care of the problem. Despite all of the drought, I can't help but notice the beauty that exists on our farm. This is the freshly harvested wheat field that we drive past on the way to the hop yard. You can actually see the heat in the air in this late evening photo taken in mid July. Our tenant farmers are doing an excellent job of growing corn in spite of no rain or irrigation. I am amazed at how well this crop is holding up. "Volunteer" sunflowers cheerfully reach for the sky in our garden. It's not all bad, it rained 1 inch today. Life on the hops farm is good.